Saint Joseph is a mysterious character in scripture. We know little about his life, and he never has a word recorded in the Bible. Even with the little knowledge we do have of Saint Joseph, we Catholics love the holy foster father or Jesus. We celebrate Saint Joseph in the month of March and May for his feast and feast of the worker. A few years ago, I painted my first image of Joseph, and I did ample research into the tradition and symbolism used historically to depict the third pillar of the Holy Family. Here are some interesting notes I found describing the meaning of these traditions. Joseph was a virtuous man that was pure and obedient to God. He had the difficult large task of caring for and protecting the Holy Family, and he did so always listening for the voice of God. He also remained pure and chase while loving and caring for his wife, Mary ever virgin. Even though they were married they remained celibate, “he had no relations with her” (Matthew 1:25a). In the few descriptions the Bible gives us about St Joseph, we do learn that he is a carpenter by trade. In his life raising Jesus, Joseph also teaches Jesus his craft to use to earn a living. Even though the saw is often used, it’s doubtful it was his primary tool since most of their work was with stones at the time and place. His work was closer to what we would associate with a mason. 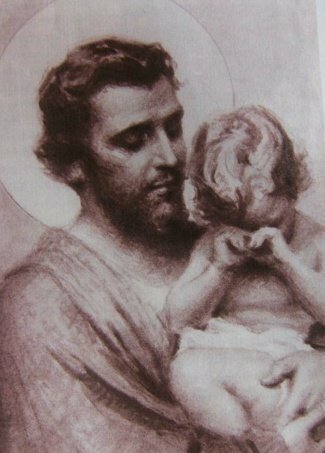 There are several saints depicted with the child Jesus in their arms, but Saint Joseph is the only Saint that had the privilege of raising the Son of God at this stage in His life. There are times when this image is confused with Jesus letting the little children come to Him, but there are usually other symbols to point to St Joseph. Joseph wasn’t just a random man that happened to pick Mary for his wife. God had chosen and prepared Joseph with special graces to care for the Holy Family. We hear this in many resources from outside of the canon of scripture. This symbols calls upon the imagery of the flowering staff of Aaron showing he had been chosen by God (Numbers 17:23). There is an unofficial legend that a staff at the door blossomed when Joseph went to visit his future wife, the Blessed Virgin Mary, to show her he had been chosen by God. There are icons and images of Joseph sleeping. While this may look like an odd action or pose for sacred art, it’s deeply rooted in the few things we for certain about Saint Joseph from Sacred Scripture. In two separate occasions, we see that God speaks to Joseph through an angel in his dreams (Matthew 1:24 and Matthew 2:14,21,22). Joseph was a hard worker, and even in his sleep, he works to pursue the will of the Father. Pope Francis made this image more popular recently admitting he often places his requests for St Joseph under the sleeping Saint Joseph for him to hear and act through intercession. Watch a video about this image. This symbol is a newer than some of the others since this symbol is one of the newer symbols for the Jewish people. Joseph is described as a “righteous man” (Matthew 1:19) and “son of David” (Matthew 1:20). He was faithful to the tradition and law of his ancestors. On a different note, the symbol commonly known as the Star of David has also historically been used to depict Mary, Star of the Sea. This is a rare symbol for Saint Joseph recalling the pair of turtle doves that Mary and Joseph had to use for their humble sacrifice at the presentation of Jesus (Luke 2:24). This was only used by Jews that were too poor to afford a larger sacrifice, and reminds us that the Holy Family was not rich in money. This is obviously for his name, and it might seem unoriginal at first. It’s interesting to note that Jesus name also begins with a J when spelt out in most languages, but it’s never used to represent the Lord. Saint Joseph is often depicted as an older man that took care of care of the younger Blessed Virgin Mary, but this depiction developed over time. Deacon Guadalupe provides a compelling argument as to why it is more likely that Saint Joseph was a young and strong man. Tradition has it that Saint Joseph died with the Blessed Virgin Mary and Jesus at his side. There is no better way to die, and he has thus been made the patron of the happy death.